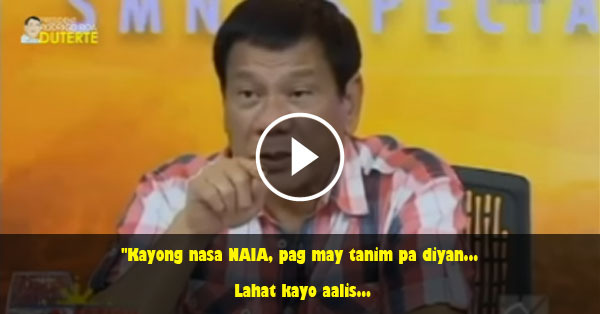 New elected President Rodrigo Duterte has sent a warning message to all NAIA (Ninoy Aquino International Airport) personnel about the issue of tanim bala. "Kayong nasa NAIA, pag may tanim pa diyan... Lahat kayo aalis..." He said to an interview. "Do not do it to me because as I said I am awed and humbled by the vote given to me by the People for after all I did not also ask that I'd be president," He added. This issue was very alarming to all the innocent passengers and Tanim-bala modus had to stop.